My Wandering Life: Oh My! Apple Pie! I don't have any memories of doing things like baking cookies or making pies with my Mom while I was growing up. We did lots of other things, but cooking together was not on the list. Which means that I don't really do those kind of things with my kids. Some women find lots of satisfaction from feeding their families and enjoy spending hours in the kitchen. I am not one of those women by any means. However, there are a couple of things that I do very, very well. One of them is making a delicious crumbly-top apple pie. 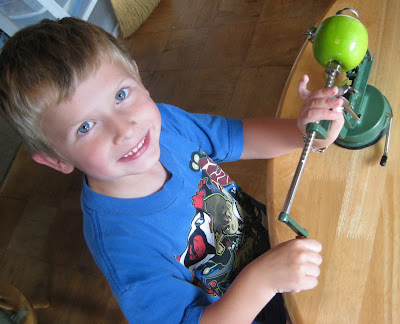 This time of year is the perfect time to break out our apple corer/peeler/slicer. Sadly, my trusty machine gave up the ghost last year, after 15 years of reducing apples into corkscrews. I ran over to Cost Plus World Market and picked up a new one, and after demonstrating to the boys how it works, they were hooked! 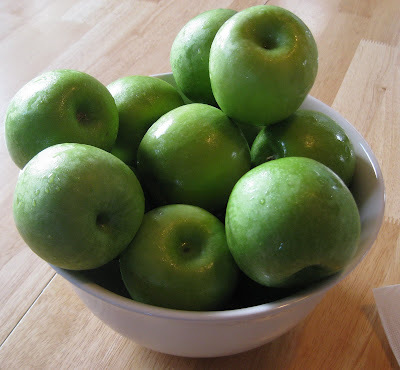 They peeled, cored, and sliced over two dozen apples, and then begged me to go to the store to buy more! 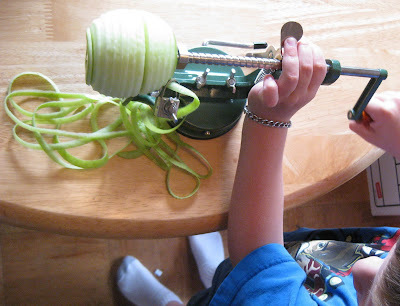 It works by just cranking a handle around, which peels the apple and then pushes it through a round hole. 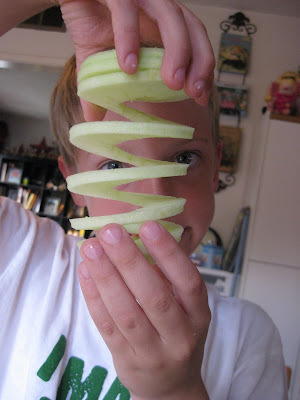 As it turns, it's being sliced into what looks like a Slinky. 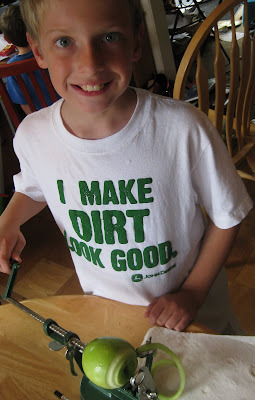 The boys called it a "Sprinky". 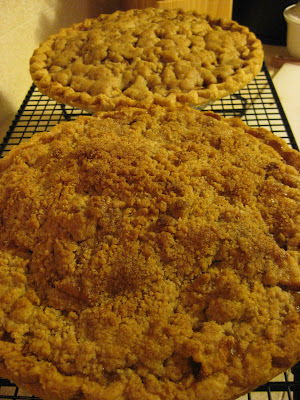 We cut up enough apples for two pies. They came out looking a little different, but they taste delicious! Especially when served warm with a huge helping of vanilla ice cream!